Scott went to get just the kids first. We did this same thing when Vera was born. 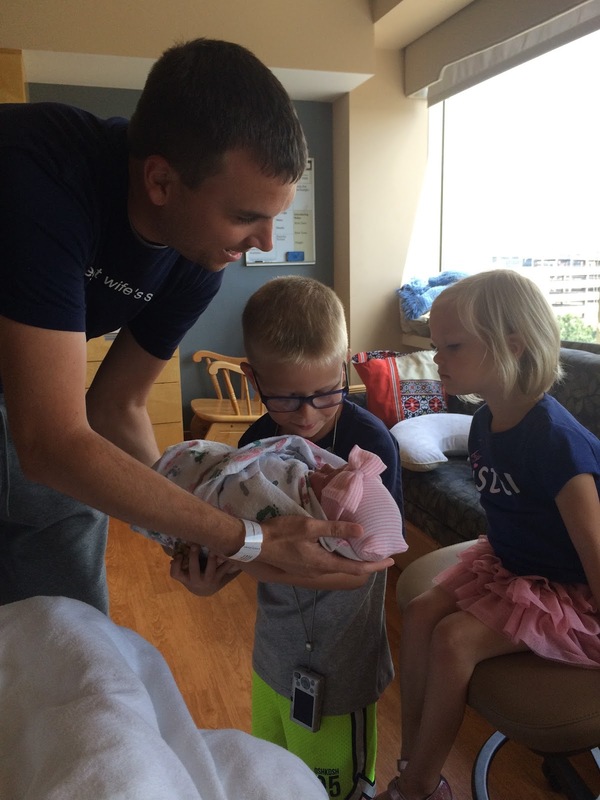 It is a little overwhelming seeing mommy in a hospital bed, etc so it gives them a little time to get acclimated, meet their new sibling and relax before all the troops come in! Solon was smitten right away and saw the pink hat and knew it must be a girl! We had shared the name with them so they knew she was Lucille Violet. Vera was a little hesitant as you can see from the photos but Solon jumped right in and wanted to hold her! As you can see from the above photo, she didn’t want to get too close to Lucy and didn’t really want anything to do with me in a hospital bed. She kept commenting I had holes in my dress (for the nursing mama ;). She snuck in closer with Scott and before we knew it she was warming up to little Lucy! YAY! Daddy went to get the rest (who still didn’t know who we had) and Solon got to announce, she was a GIRL! Such a proud big brother. He really didn’t want to share her and let others hold her. I think he had a turn between everyone else’s turn ;). He started singing lullabies to her and made this mama tear up. It was such a sweet, precious time of answered prayers for our little family! **We called all of Scott’s family while waiting for the kids to arrive. Everyone was pretty excited and pretty shocked she was born so shortly after I last had texted. Some more shocked then others, she was a girl! Auntie Raquel called it from about 7 weeks on ;)! We had lots of texts before we called saying, “We haven’t heard from you, what’s going on? You said you would be checked at 2, it’s after 2?” We laughed because we never made it to the 2pm check, she was born at 1:59pm!